Dell 400-AFNY /NWCCG SAS / Serial Attached SCSI Hard Drive Kit. Dell 400-AFNY / NWCCG 6000GB / 6TB 7.2K 6.0Gbps NL SAS / Serial Attached SCSI Hard Drive 3.5 F238F Kit - Brand New. Brand New -The product is new sealed in it's factory packaging. Dell 400-AFNY / NWCCG 6000GB / 6TB 7.2K 6.0Gbps NL SAS / Serial Attached SCSI Hard Drive F238F Kit - Brand New. This kit contains one 6000GB / 6TB 7.2K 6.0Gbps SAS / Serial Attached SCSI Hard Drive and one Dell F238F tray and is fully compatible with Dell PowerEdge R710 server with new style angular facia. Enhance the storage capacity of your Server with the 6000GB 7200 RPM Near Line Serial Attached SCSI Hard Drive from Dellâ¢. This hard drive helps you to store large amount of data and the spindle speed of 7200 RPM facilitates faster access to all your stored data. This product has been tested and validated on Dell systems. Alternate Part Numbers: NWCCG 0NWCCG. This complete drive kit contains. (1) 6000GB / 6TB 7.2K 6.0Gbps SAS / Serial Attached SCSI Hard Drive. 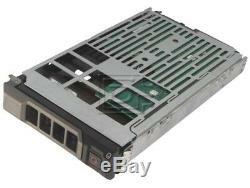 (1) Dell F238F drive tray. Industry's highest 7.2K performance Formatted capacity: 6000GB Seek time as fast as 3.8ms Designed for 1.6 million hours MTTF 150MB/s maximum sustained data rate Enhanced S.
Formerly DiscounTechnology not Discount Technology San Diego California USA. 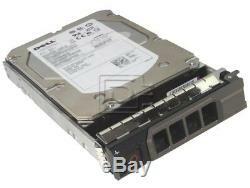 The item "Dell 400-AFNY /NWCCG 6TB 7.2k SAS / Serial Attached SCSI Hard Drive Kit R520" is in sale since Tuesday, February 5, 2019. This item is in the category "Computers/Tablets & Networking\Drives, Storage & Blank Media\Hard Drives (HDD, SSD & NAS)\Internal Hard Disk Drives". The seller is "discountechnology" and is located in San Marcos, California. This item can be shipped worldwide.